Health and Health Care 2010, Second Edition, offers well-researched coverage of health insurance, managed care, health care providers, the health workforce, medical technologies, information technologies, consumerism, public health services, mental health, child health, health of the elderly, chronic care, and health behaviors, and more. Each of the volume's topics starts with historical background leading into the contemporary setting and is followed with predicted short-term developments and forecasts reaching to the year 2010. Acknowledging the difficulty of long-term predictions, even by experts, the projections are cast as "stormy," "long and winding," or "sunny." 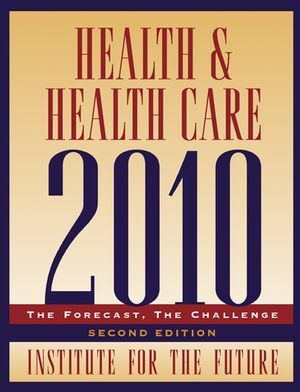 Chapter 1: Health and Health Care Forecast. Demographics: Patients, Populations, and New Consumers. Payers and Health Care Costs. Care Processes and Medical Management. Chapter 2: Demographic Trends and the Burden of Disease. The United States Population Is Growing Older and Living Longer. The Face of America Continues to Change-Diversity Is Increasing. Household Income Is Increasing, but the Gap Between the Extremes Is Widening. The Shifting Burden of Disease: Chronic Diseases, Mental Illness, and Lifestyle Behaviors. Chapter 3: Health Care’s Demand Side. Changing Trends in Growth Rates 1960–2010. The Issues: What Drives Cost Increases? The Forecast: Real Cost Growth at 1 Percent. The Significance of Our Cost Forecast for the Rest of Our 10-Year Outlook. The Issues: How Will People Receive Health Insurance? The Forecast: Source of Insurance—Where Are the People? . . . .
. . . and What Type of Insurance Will They Have? The Issues: Managed Care is out of Balance. Regulation May Have Cost Consequences. Potential Barriers to IT Implementation. The Forecast: Experiments in Reinvention. Managed Care 2010: Patterns of Power. Chapter 6: Health Care Providers. Themes of the Future Delivery System. Reimbursement Models: Between Finance and Delivery. Care Delivery Organizations for the Next Decade. Medical Management: The New Arena of Activity. Chapter 7: Health Care Workforce. Will Health Care Join in the Information Age? The Forecast: Four Big Effects in Health Care. Progression of Information Technology into Health Care. Chapter 10: Health Care Consumers. Three Tiers of Health Care Consumers. Chapter 11: Public Health Services. The History of Public Health in the United States. Key Factors Affecting Public Health in America Today. Public Health Frameworks and Strategies: Problems of Perception. Reconciling Public Health and Private Medicine. The Future: Scenarios and Forecasts. Forecast of the Future: Organizational Issues. The Hope of Science and Services. Facing the Problem and the Facts. Determining Priorities for Public Spending. Mental Health Services Changes in the Next Decade. What Keeps Kids Healthy? Access and Environment. Access to Health Services: Enough Providers? Physical Environment and Increasing Chronic Illness. Chapter 14: Health and Health Care of America’s Seniors. The Demographics of an Aging Population. The Economic Status of Seniors. Elder Health Care Financing Through Medicare. Chapter 15: Chronic Care in America. Chronically Misunderstood: The Who, When, and What of Chronic Illness. Chronic Care Today: How We Got Here. Weaving Disease Management into the Fabric of Patient Care. Drivers and Barriers on the Path Ahead. Alcohol and Drug Abuse in America. Injury Prevention: A Focus on Guns. Chapter 18: Expanded Perspective on Health. Socioeconomic Status as a Determinant of Health. The Paradigm Shift: Evolution or Revolution?